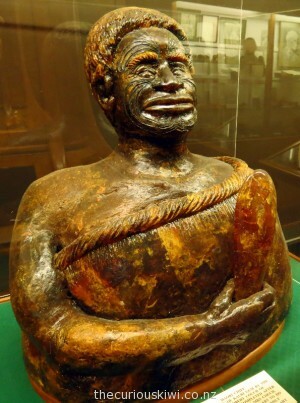 Kauri gum was also carved and the museum has a few gum carvings including a bust of a Maori chief. An unusual use for kauri gum was to make hair and wigs. (Look for the kauri gum plait in the cabinet with the gum beads). 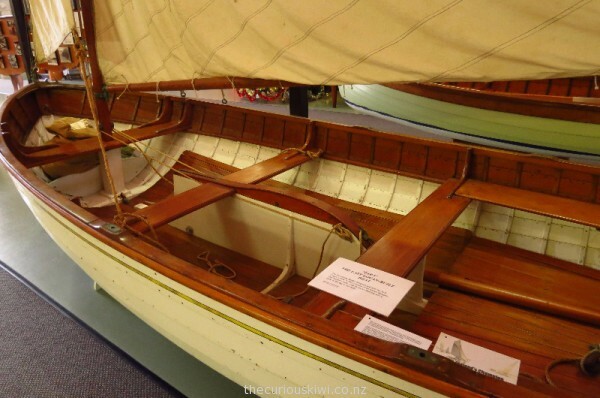 Kauri wood was used by Maori to build waka (canoe), and by European settlers to build boats and furniture. 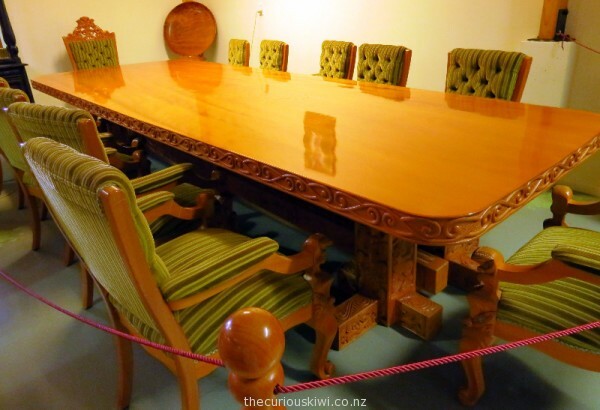 The Kauri Museum has an impressive kauri furniture collection including a table and 12 chairs commissioned by the Chairman of Dominion Breweries. The table and chairs were used in the DB boardroom from 1977-1986. The table was made from a single slab of 1800 year old kauri and including its steel supporting frame, weighs over 1000 kgs. The table and chairs were carved by Brian McCurrach from Auckland in a style influenced by the Whakatohea people on the east coast of the North Island. In the Smith Wing and Steam Sawmill areas there is equipment used for tree felling, and steam powered machinery that was used to saw kauri and transport the timber. Animal power was also harnessed and one photo shows a team of 32 bullocks pulling a kauri log (and part of the habitat of native birds) from the bush in Ahuroa in 1928. Complementing these displays are numerous photos, and models in scenes showing what life was like for early settlers and those involved in the kauri industry – ‘hard yakka’ to quote one gum digger. Tip: If you’ve got a TOP 10 card get 40% discount on admission. There is also a 2 for 1 discount voucher in Arrivals magazine (pick up a copy at arrivals at Auckland International Airport or look out for it in i-SITES). 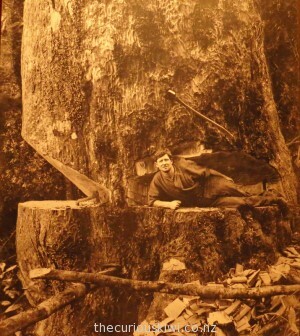 *The museum has a Tudor Collins Wing and it is full of photos he took while working as a bushman in the kauri forests. Visitors can also buy the book – Kauri Cameraman by Paul Campbell. This entry was posted in Bay of Islands/Northland, Unusual New Zealand and tagged kauri, kauri gum, The Kauri Museum by thecuriouskiwi. Bookmark the permalink. Great informative post – I´ll have to check out this museum next time I´m in NZ! New Zealand has so much to offer – nature, stunning landscapes, modern cities and history, to name a few. I love how you’ve investigated the history and traditions of the Maori people. Sorry, I missed your comment when it came through. Thanks, the museum concentrates on early European settlers so there’s not a lot of information about Maori and kauri unfortunately. At some stage I’d like to visit some of the smaller museums in Northland to see what information and displays they have, I became fascinated by all things kauri as we travelled through the area. oh I love this place, we lived in Maungaturoto for 8 years so I use to visit there with my 3 nearly grown up children regularly. Kauri was a theme of our trip and I found it fascinating learning about the history of Northland and the mighty kauri trees. I was surprised at the size of the museum and can imagine if you asked children to count the number of pieces of kauri gum it would keep them occupied a while!